Arriving in a dark, damp Amsterdam, Alex isn’t convinced this trip will be any fun. His dad will be spending most of the time working and he’ll be bored. That is until he finds out Angelien, his dad’s editor’s daughter, has offered to keep him company. On their first day in the City Alex is attracted to a mask at an antiques market. However thus is no ordinary mask, and it seems to have a connection to Alex that he doesn’t even know himself. What a strange and brilliant book. 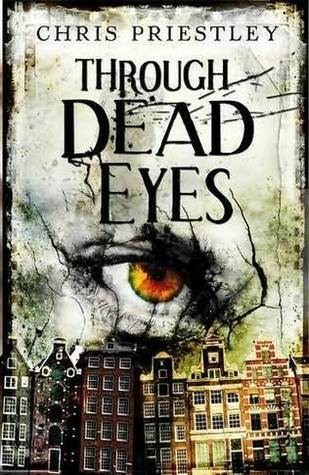 Through Dead Eyes captures the beauty and history of Amsterdam perfectly whilst adding a serious element of mystery and horror that you expect from an author of this calibre. The book follows Alex’s adventures learning all about Amsterdam through Angelien, his dad’s editors daughter, who is a historian of the 17th century. It starts with Alex’s suspicions that all is not right with his hotel and specifically his room then when he is drawn to a mask in an antiques market and finds that it’s possible the mask belonged to the girl who lived in his hotel back when it was a house things get really odd. There’s some element of contemporary issues going on and mainly they are there to indicate that perhaps what Alex is seeing isn’t real and is part of the stress having to deal with other things in his life, but these things aren’t as good as the chill created from the horror part of the book so I was more focused on that. The characters were a little flat for me. I hated Dirk and Alex’s father was a tool. Alex himself seemed a little wet and ridiculously young, I’m not sure how old he was, from the story itself and what he thinks about Angelien I would guess around 17 but I think he acted more like 14. Saskia was nice but we don’t see her much and Angelien was interesting but I think she overreacted at the slightest of things which was a little ridiculous. The book was short but well written, it was not my favourite Chris Priestley book, in fact it’s possible it’s at the end of the list but it’s worth a read anyway, especially if you enjoy a bit of a historical mystery which will chill you to the bones. I think my favourite part of the book was the last few chapters and I adored how it ending so if you think it’s going a little slow I really would recommend sticking with it. Through Dead Eyes was published in paperback on March 14th by Bloomsbury children’s books. My copy was sent to me from the publisher in exchange for an honest review.